Whether you are recording in a professional or home studio, choosing the right equipment is of key importance and microphones are no exception. However, picking the best microphone for recording your guitar can be a complicated affair. In this article we’ll take a look into some of the best guitar mics, broken down by recording electric and acoustic guitars, as well as how to choose one. Take a look at my handpicked list of studio mics that are perfect for recording electric guitars. When it comes to recording electric guitar, few mics can match the popularity of the Shure SM-57. This mic’s been used by amateurs and pros from all over the world. It’s been around since 1965 and doesn’t seem to be going anywhere anytime soon. This fantastic mic is famous for its amazing durability; it’s even been run over by a bus to demonstrate its superior build quality. The 57 has a compact body and a cardioid polar pattern, as well as a good frequency response (40Hz – 15kHz). In the studio, the SM-57 excels at recording vocals and electric guitars. On the other hand, recording acoustics is not among its strongest suits. The E609 is one of my favorite instrument microphones of all. It is great for both stage and studio use. 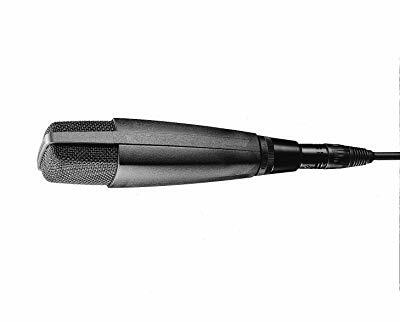 In the studio department, this stylish low-profile mic excels at recording electric guitars. The 609 has an elegant, vintage styling and combines metal and plastic in its construction. The element is encased in metal grill with plastic edges, while the handle is made of metal. This mic has supercardioid polar pattern and can take in excess of 150db SPL without breaking a sweat. This means that you can crank that amp much louder. The frequency response curve is tailored for recording instruments, peaking in the 3kHz – 6kHz range. The C414 is there for people who want the ultimate performance and don’t mind paying top dollar for it. This AKG flapship series mic belongs to the reference class. This mic comes with a classic, stylish design and sturdy construction. The beautiful see-thru metal grill gives a nice contrast to the black housing. With the C414, you get a condenser element with nine selectable polar patterns. Also, there are three levels of attenuation (noise reduction), as well as three selectable bass filters. This deluxe mic can withstand up to 158dB SPL. In the studio, you can use it for pretty much anything, though it excels at recording instruments, especially electric guitars. The original MD 421 is a legendary studio microphone through and through. It’s been the weapon of choice of many professional guitarists for over 35 years. The MD 421-II is its equally ubiquitous successor. This is a large diaphragm microphone with dynamic element and cardioid pick up pattern. The element features a humbucking coil which reduces noise pickup in the lowest frequencies. In the studio, this mic will perform equally well on vocals and instruments. The pronounced directivity makes it great for recording electric guitar amps and drums. Flat response and high SPL capacity are also among the MD 421-II’s strong sides. Sturdy and well-built, this is a classic mic in design. It is also humidity and dust-resistant. The TLM 102 is one of the newest members in Neumann’s famous TLM line, as well one of the most affordable. 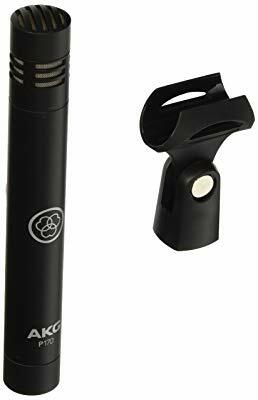 Overall, this is a fantastic microphone that boasts a flat response, clean delivery across the frequency spectrum, and pretty high SPL (around 144 dB). It however has a slight boost in the high range for some added brilliance. 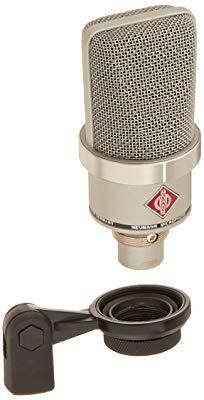 The Neumann TLM 102 is a beautifully designed compact microphone with a large diaphragm. It has a condenser element with cardioid polar pattern. This mic is a definite recommendation if you’re looking for a high-quality mic to record your electric guitar. The mics below are all great options for recording your acoustic guitar. The Perception 170 is one of AKG’s affordable instrument microphones. It is used in studios worldwide by both amateurs and professionals. The P170 comes has compact metal body. It is available only in black and the styling is understated. This rugged and durable microphone is built to last. The choice of small diaphragm and condenser element points it towards recording instruments, especially acoustic string instruments. Recording drums is also one of its strengths. As for connectivity, it has a standard 3-pin XLR connector located at the bottom. On the technical side, the P170 offers adjustable attenuation and exceptionally high SPL (up to around 155 dB). It features a cardioid polar pattern. Here we have a small-diaphragm condenser microphone with the sturdy and durable construction that Shure is famous for. This is a great option if you want to capture high-quality sound in great detail. The frequency response curve is flat across the audio spectrum (20Hz – 20kHz) and there are two levels of attenuation (6db and 18 dB roll-off per octave). This is a super quiet mic, with symmetrical cardioid polar pattern. 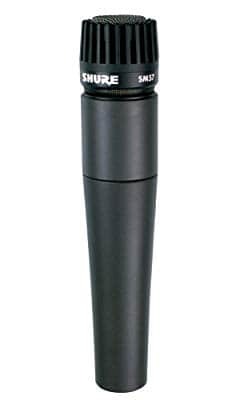 The SM81 is a phantom-powered mic that comes with a standard XLR connector. Apart from the studio, where it excels at recording acoustic string instruments, it can be used on stage for miking up acoustic guitars, pianos, and drums. Also, the SM81 can be used for room recordings, being equally good for capturing single instruments and group performances. The AT2020 is one of Audio-Technica’s lower-end options pricewise. It offers great performance, easily one of the best price-to-performance ratios. A definite recommendation for recording acoustic guitars. This is a true condenser microphone with side address. It comes with a rather large diaphragm and has a cardioid polar pattern. The AT2020 is a phantom-powered microphone (requires an external power source). The mic itself is among the larger ones and rocks all-metal construction. It looks and feels sturdy and can take a lot of abuse. Accessories include a carrying pouch, a stand mount, and a 5/8”-3/8” adapter. The frequency response range is a flat 20Hz to 20kHz. MXL microphones are among the best on the market when it comes to price/quality ratio and the 770 is no exception. Though in the budget class, this mic looks and feels professional-grade. The recording quality is comparable to substantially more expensive models. 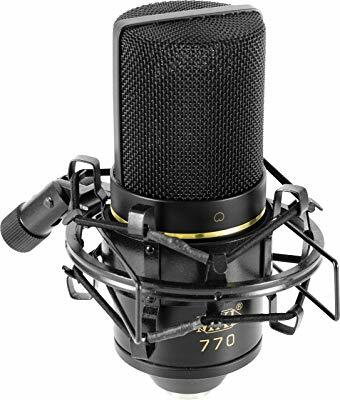 The MXL 770 is a condenser microphone with cardioid polar pattern and side address. It boasts low self-noise and crystal clarity, especially in the high end. 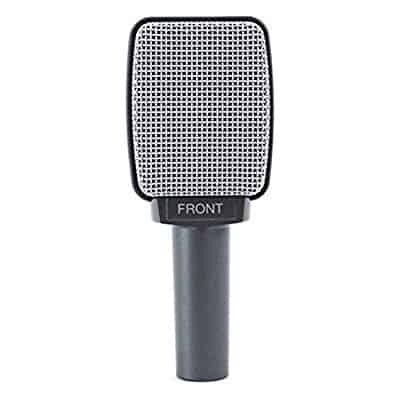 This mic comes in a sturdy foam-padded plastic bag and includes a vintage-style shock mount. This is an elegant, classically-styled microphone. It is painted in black with gold details. This instrument microphone excels at recording acoustic string instruments, pianos, and drums. Rode is one of the biggest players in studio microphone. Their microphones have been used by professionals and enthusiasts all over the world for the past five decades. The NT4 is one of my favorites from Rode. This stereo microphone features a pair of perfectly matched heads in 90-degree alignment. The heads are equipped with ½” condenser capsules with cardioid patterns. As for the power, NT4 can either use 48V phantom power or its own 9V battery. It also features a standard 3-pin XLR connector at the bottom. The microphone comes in a foam-padded protective case, together with an XLR cable, twin-head windshield, and 5-pin minijack. 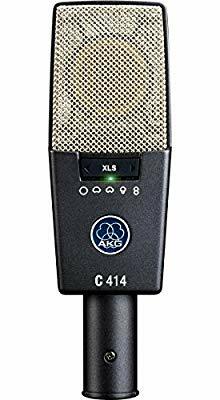 In the studio, the NT4 is one of the best acoustic guitar mics. One of the first things to consider when recording your acoustic and electric guitar parts is the type of the microphone you want to use. 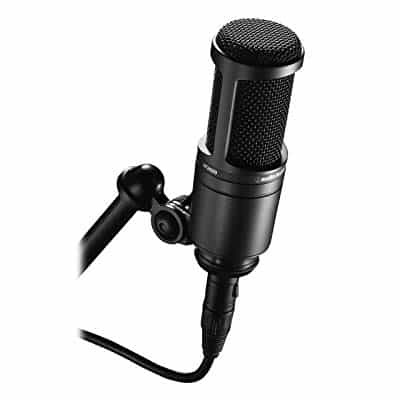 Generally, there are three main types of microphones used in studios – dynamic, condenser, and ribbon. Here’s a quick overview of each type and its main characteristics. Dynamic microphones are great all-rounders in the recording studio and probably the best choice for the inexperienced. They use magnetic diaphragms with moving coils and can catch the sound pretty reliably. Dynamic mics can handle a ton of decibels which makes them well-equipped for recording drums and guitar and bass amps. Condenser mics are more sensitive and fragile than their dynamic siblings. Thus, they are better suited for recording acoustic instruments. Also, they are more complex and expensive than dynamic mics. A condenser mic has a conductive diaphragm set against a metal backplate. When sound pressure moves the membrane, it changes the capacitance, thus creating sound. Ribbon mics rely on thin metal ribbons to pick up sound. They are able to record high frequencies without sounding aggressive and harsh. They also have that “vintage” tone. While ribbon mics have been almost completely suppressed by condenser and dynamic models, they are making a comeback these days. The directivity of a microphone is one of its most important properties, as it largely dictates its use. There are six main polar patterns modern microphones use – cardioid, supercardioid, hypercardioid, bidirectional, omnidirectional, and lobar. Here’s a word or two about each of them. Cardioid pattern is the most popular due to its versatility and wide range of applications. Mics with cardioid polar patterns capture sound from the front, blocking out the input from the sides and the back. They are great for settings where you need to reduce noise and feedback to a minimum. Supercardioid models, in addition to the front, also pick up some signal from the back. Also, their frontal sensitivity area is somewhat narrower than that of cardioid mics. However, they are great at isolating noise coming from the sides. This makes them good for loud stages and untreated recording rooms. Hypercardioid mics pick up a bit more signal from the back than the supercardioid. On the flipside, they are a bit better at rejecting noise coming from the sides. Bidirectional microphones capture sound from the front and the back, while rejecting noise coming from the sides. If you intend to record in stereo, a bidirectional mic might be your best bet. The bidirectional approach is most commonly found on ribbon mics and large diaphragm mics. Omnidirectional microphones, as their name hints, pick up sound from all directions and have zero rejection. They are good at capturing details and, thanks to accepting all reflected sound, result in a natural recording. They are also a good choice for recording multiple instruments at once. However, omnidirectional mics are prone to feedback, so you’ll need to keep the noise to a minimum. Lobar pattern, found exclusively on shotgun microphones, is the narrowest of the represented patterns. Mics with lobar pattern are very directional, as they have a super narrow frontal pattern. Sounds coming from the sides are canceled out through phase cancellation. These might be good for recording choirs or drum cymbals from the overhead position. In terms of diaphragm size, modern recording microphones can broadly be divided into three categories – large diaphragm mics, small diaphragm mics, and medium diaphragm mics. The choice of the size should depend on what you intend to record and the result you are aiming for. Regardless of the size, you should make sure your microphone has flat frequency response. Here’s a quick overview of each major type. Large diaphragm microphones come with the biggest diaphragms among the three, a feature which lets them capture more details in the sound. This is thanks to the large diaphragms being more sensitive to air vibrations. You can use them to record pretty much anything, as long as you keep the noise to a minimum. Small diaphragm microphones are commonly compact and cylindrical. They are less sensitive to air vibrations than their large diaphragm siblings and can handle far higher SPL. Also, they have a wider dynamic response and are made to be stiffer and sturdier. Common uses include recording electric instruments, cymbals, and hi-hats. Medium diaphragm microphones represent the middle ground solution. Compared to large diaphragm mics, they are more sensitive to high frequencies. On the other hand, they are warmer and have a fuller sound than the small diaphragm models. A solid medium diaphragm mic might be your best bet if you’re looking to record both acoustic and electric guitar parts. There are many ways and approaches to miking a guitar amp for recording. Basically, the position of the microphone, as well as the number of them, should depend on the sound that you want to achieve. Since every guitar/amp/mic setup is unique, there can’t be one approach that fits them all. Below, I’ll briefly discuss some of the most popular techniques and how they generally affect the tone. The first method is with a microphone positioned at the center of the speaker’s driver, aiming straight towards the center of the membrane. This is called on-axis position. This way, you will get the brightest and most aggressive tone that your rig can deliver without tinkering with volume, EQ, and effects. In this position, the high frequencies will be at their strongest. If you decide to place your microphone near the edge of the membrane, you will get the strongest low end possible at a given volume, EQ, and effects setting. On the other hand, the sound recorded this way will lack the high end. This can potentially cause problems down the road when you add the bass track to the mix. You can solve this issue by tweaking the EQ and using high pass filter. When the microphone is around half-way between the center and the edge, the sound will have equal amounts of lows and highs, as well as a good balance between brightness and warmth. The distortion will still have a strong bite, but will not be too harsh. If the bass is still too strong for your taste, you can use EQ and high pass filter to remedy this. In the fourth case, the mic remains at the same position as in the third but is angled towards the edge of the speaker. The sound will be similar to the one in the previous case, but you will get slightly more aggressive distortion and better frequency balance. There are, of course, many other ways to mic up a guitar amp. Some approaches include two microphones in similar positions, two mics in different positions, one mic in the front and another in the back, additional room microphones, and more. The only hard and fast rule here is that you should use whichever approach that gives you the result you are most satisfied with. Recording acoustic guitar is arguably a harder and more complicated process than recording an electric. 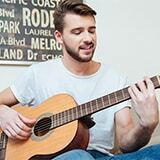 When recording acoustic guitars, room acoustics play a bigger role. There are many approaches to miking acoustic guitars for recording, though most often you will use two or more mics. Here’s a quick overview of the most common settings. With the Blumlein technique, you have two bidirectional mics set very close to each other at 90 degrees. The angle often looks at the one of the upper frets. This approach gives a clear and wide sound that’s fit for a wide variety of styles and genres. You can route the sound in mono or stereo and it will work in a majority of mix situations. If you’re using two mics, you can set them apart with one pointing at the 12th fret and the other at the 8th. Play around with the distance from the guitar until you find the sweet spot. You don’t want the guitar to sound thin and you don’t want to choke it, either. If you have small diaphragm mics, set them closer to the guitar than you would large diaphragm mics. This approach gives very detailed recording, as it captures all the subtle sounds and noises. Next, we have a pair of vertically spaced mics. The lower mic aims at the bottom three strings, while the upper one is looking at the top three strings. For a good balance between the high and low frequencies, angle the mics slightly inwards. The end result is a very intimate sound, great for recording singers/songwriters and performers/bands with only guitars and vocals. While the Blumlein method calls for the mics to be positioned vertically, the XY method sets them horizontally. The mics are as close to each other as possible and form a 90-degree angle. The angle should aim at the guitar. You can experiment with the distance of the microphones and their aim (typically between the soundhole and the 12th fret). Use this approach when you don’t have enough time to tinker around with the wide stereo setup. If you only have one large diaphragm cardioid mic, place it in front of the guitar with the front side (the side that picks up the sound) aimed at the guitar. It should point anywhere between the upper frets and the soundhole. This way, you’ll get a narrow tone which lends itself nicely to double-tracking (recording the same pattern twice and panning them to the opposite sides). The cardioid mic will mostly pick up the sound coming straight from the guitar, leaving a lot of the ambient noise out. This approach is good for songs driven by the acoustic guitar. Selecting the right guitar microphone is no easy task. There are many things to consider and countless models to choose from. But after all is said and done, the best guitar microphone is the one which gives you the sound you want. I sincerely hope you found this article helpful.